What Do Mussels Taste Like: Perception Building About Mussels! Seafood always attracted us towards its world. Be it their mysterious life style and nature or their taste, seafood items are equally intriguing to all cooks worldwide. Mussels are an interesting item in the seafood dish. They look slimy and unappealing from the exterior but the taste is quite exclusive. We have seen plenty of people being afraid of trying out new seafood. The reason for being scared is the uncertainty of these seafood items. People get concerned with the safety. 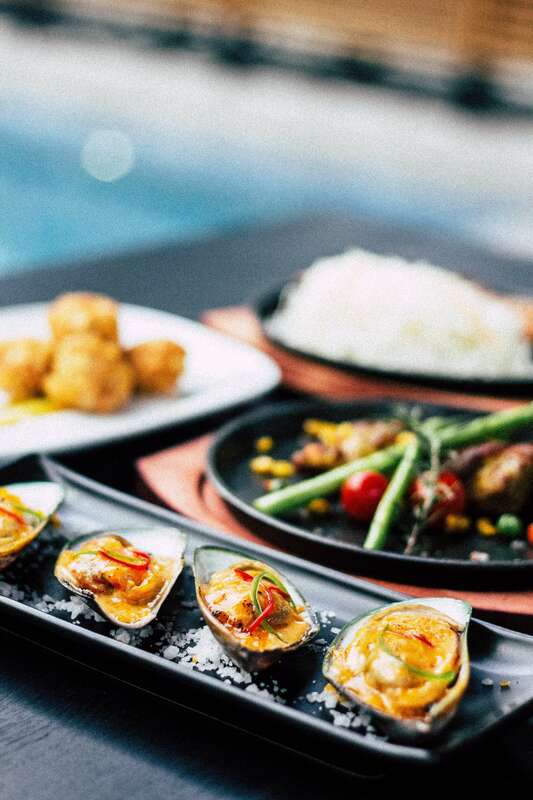 Our today’s article will elaborate you with the taste of muscles and you can safely consume mussels with efficient cooking. What do mussels taste like? Should you be worried about mussels? How to cook and store mussels? First of all, we would like to clarify that most types of mussels are edible and belong to the phylum Mollusca. They are as a matter of fact quite famous as part of seafood dishes. Mussels are not something very uncommon that we are suggesting you to eat. Mussels possess shells and you can identify them with these dark colored shells. In terms of shape, the shape is somewhat oval shaped. Also, the shells are like semi-circular in the top. Mussels are both freshwater and marine species. They can also be grown artificially. Usually artificial production of mussels is done with the help of suspended ropes in water. Well, the taste of mussels varies a bit between their harvesting styles. But the change cannot be detected that much. Let’s break the suspense right away and let you know about the taste of mussels. The mussels are actually a bit chewy when you take a bite. This texture sets it apart from other seafood items. Added to that, you can feel a natural ocean flavor from the mussels. Interesting flavoring actually! With mussels you do not have to do much flavoring. Using the right dips is basically the essential part here. This natural ocean flavor intrigues both the chefs and scientists. The basic assumption is that since mussels main source is from there, the flavor is inherent among them. The edible part of the mussels is basically the flesh. The flesh is somewhat soft and yet feels chewy in the mouth. For its flesh and chewy texture, there are many that terms mussels as ‘chicken of seafood’. We honestly do not agree to this statement. We feel seafood is a type of delicacy that possess extremely unique flavors and shouldn’t be compared to other dishes. Probably people named mussels as such to increase its popularity among the non-seafood lovers as well. In that case, we would definitely say that yes you should give mussels a try even if you are not a seafood fan. Trust us; you are missing out on a very delicious food item if you haven’t tried mussels yet. If you ask what’s the best part about mussels taste. We would say hands on the tender chewiness of the soft flesh. The mild natural ocean taste is a cherry on top over that. If there was a rating on this particular food’s taste, it would have surely won our five stars. Mussels come in a lot of varieties and classification. Most of them are edible and possess somewhat similar taste. The interesting fact to know here is that around eighty percent of the mussel production of the world comes from Europe. Let’s discuss about some of the common mussels today for your better understanding. This is a larger mussels compared to the common ones. No need to get startled with its large size. It’s safe for consumption. They are mostly found in the regions of New Zealand. The reasoning for its naming is due to the presence of slight green color at the corner of its shell. Feel free to use green lip mussels in any sort of recipe with mussels. This is the most common edible mussels. When someone refers to the term ‘edible mussels,’ you would understand that they are talking about blue mussels. Blue mussels have the best flavor among all the other mussels. It is smaller than size compared to other mussels. Another factor to consider here is that this category of mussels is more expensive for its better flavor and taste. They are available during winter and spring. Mediterranean mussels are harvested during the season of summer and fall. Basically, you can understand by now that you will find at least one type of mussel to eat during each season. They are used interchangeably. The shells are a bit wide and the meat is quite plump. This makes it more appetizing to many. Clams are often mistaken as mussels and vice versa. They look almost similar but they do have some distinctive differences. For starters, mussels grow in sweet and salt water and can be produced artificially as well. Clams can only grow in fresh water. Both clams and mussels fall under the same category of mollusks. When it comes to their taste, we have already talked about the taste of mussels. Coming to clams, the texture is a bit different. 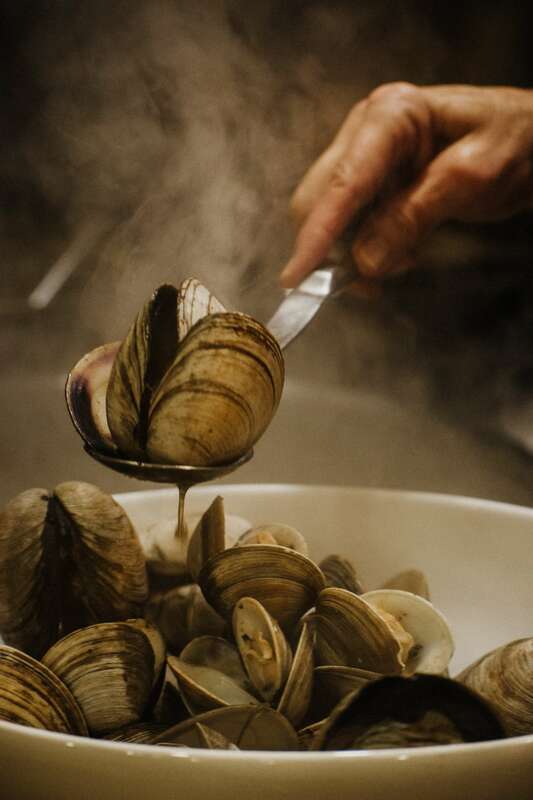 Clams are also chewy and they can be eaten both raw and cooked. However, compared to mussels, the chewiness of clams is a bit rubbery whereas that of mussels are soft and tender. In terms of flavor, mussels have a natural ocean flavor whereas clams flavor is a bit salty. The saltiness is in fact delicious of clam. 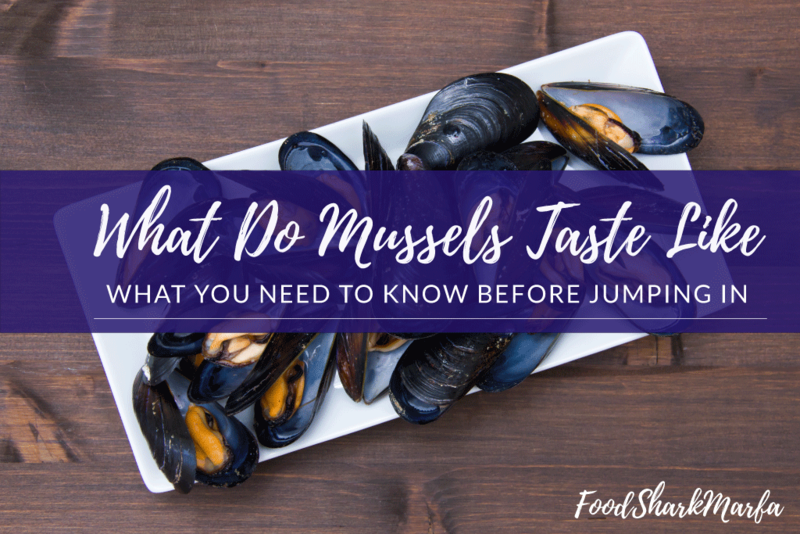 But when you taste mussels or clams, you can clearly state the difference from their flavors. No matter in which way they are cooked, both mussels and clams retain their flavor and you can identify which is which. When you are planning to buy them, it’s normal that you can’t taste them before buying. The only way to identify the difference is through their exterior look. Now sellers usually state clearly whether it’s a mussel or a clam, still we will share the exterior differences with you for your better understanding. Between mussels and clams, the shells of mussels are a bit longer. The shape of the shells of mussels is less circular compared to clams. Basically, mussel shells are somewhat oval in shape and that of clams are spherical. Mussels usually have slightly rough shell exterior whereas clams possess smooth shells mostly. You can differentiate between the two through their shell size. Notice that the shells of clams are equally divided into two parts but for mussels, the shell sizes vary. The cooking mechanism of clams and mussels are different as well. We would recommend not using them interchangeably in dishes. As the flavors are entirely different among the two, using them interchangeably is not such a good idea. But both mussels and clams have one thing in common; they both taste really great! It’s not that mussels help preventing a lot of diseases or something. But having them in your regular diet possesses quite a number of health benefits directly and indirectly. Usually, mussels are a delicacy and people eat them solely for its tasty texture and flavor. Along with being really delicious, you unknowingly consume a good amount of nutrient value as well. Therefore, it’s a win-win! A 3 ounce serving of mussels possess just about the right amount of calories and protein. That’s the beauty about seafood items. They are both nutritional and tasty. Each serving of mussels contain approximately 150 calories and 20 grams of protein. This means you can easily incorporate mussels in your meals without facing any issue with calorie and protein intake. Because the amount it has is optimum. A single serving of mussels possess around 4 grams of unsaturated fat. This type of fat is heart healthy as well. Other than these, mussels contain good amount of vitamins for you. Mussels are specifically rich in vitamin B-12. In fact, a single serving contain around 20 micrograms of vitamin B-12. This vitamin is essential for better blood circulatory system and nervous system. This vitamin also plays a vital role in DNA synthesis. Iron plays an important role in building a better immune system in the body. Not to mention how important it is for efficient blood circulation. Men and women require 8 and 18 milligrams of iron regularly. Luckily, per serving of mussels contain around 6 milligrams of iron. This will contribute in your regular iron requirement for the body. Another mineral that is essential for better immune system and cell growth is zinc. 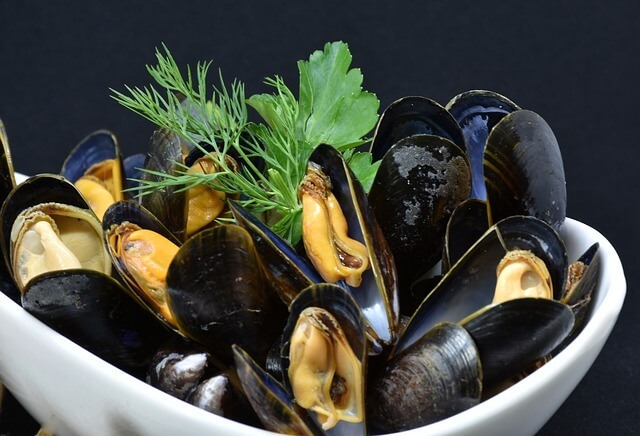 Mussels possess 2.5 milligrams of zinc per serving. Therefore, the bottom line is that mussels are a great source of minerals for your body. Fear of eating shell fish is a common phenomenon among foodies. Shell fish does bring a few drawbacks in your diet. Is it safe for consumption is a common query among individuals! Consuming wrong type of shellfish can lead to allergies, foodborne diseases and various other health deteriorations. But normally consuming mussels from hotels and restaurants are safe from consumption unless you are allergic to shell fish. If you have eaten oyster and clams before and saw allergic reactions to your body, it’s better if you don’t eat mussels. Normally when you cook mussels and it opens at ease, this means they are safe for consumption. For being risk-free, we would suggest eating and buying mussels from known places only. Eating something exotic or unknown might be hazardous to your health. The best way to detect good quality mussels is to check the shell. When you tap the shell if the mussels close tightly, this means they are good quality mussels and safe to consume. Take the mussels in your hand and feel if they seem heavier than their size. This attribute is for good quality mussels. We would recommend buying mussels just the day before cooking. It’s not wise to store mussels for a long time. This might lead to food poisoning. Hence, the best way to store mussels is to keep them inside fridge. They should be kept loosely wrapped so that they can breathe within. 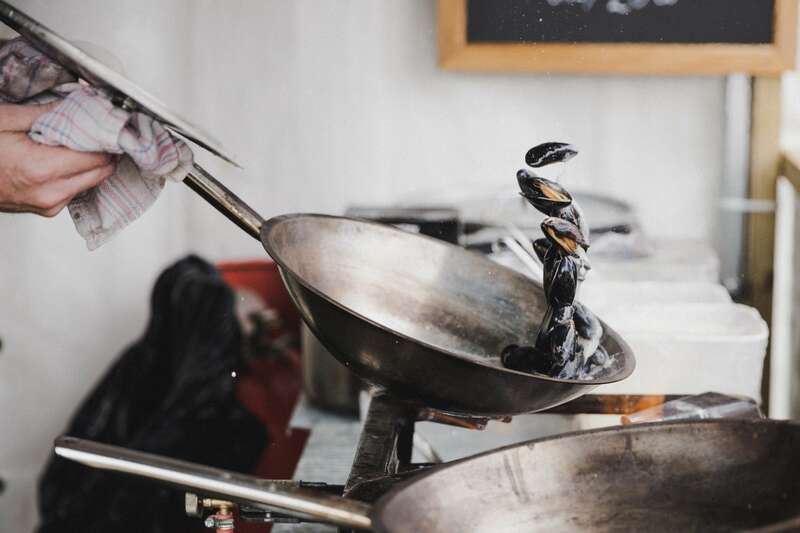 We will be sharing some great mussel recipes with you but before that, we would like to talk about some common mistakes people do while cooking mussels. The first problem cooks do is that they use too much wine while steaming mussels. When you use wine in the recipe, first of all the mussels lose a lot of its nutritional value. The second problem is that the mussels tend to stay undercooked due to excessive use of wine. They become boiled rather than getting steamed. Our advice is to use smaller amount of wine. It’s better to cook the wine a bit before putting the mussels on them. This will provide the right texture and flavor of steamed mussels. 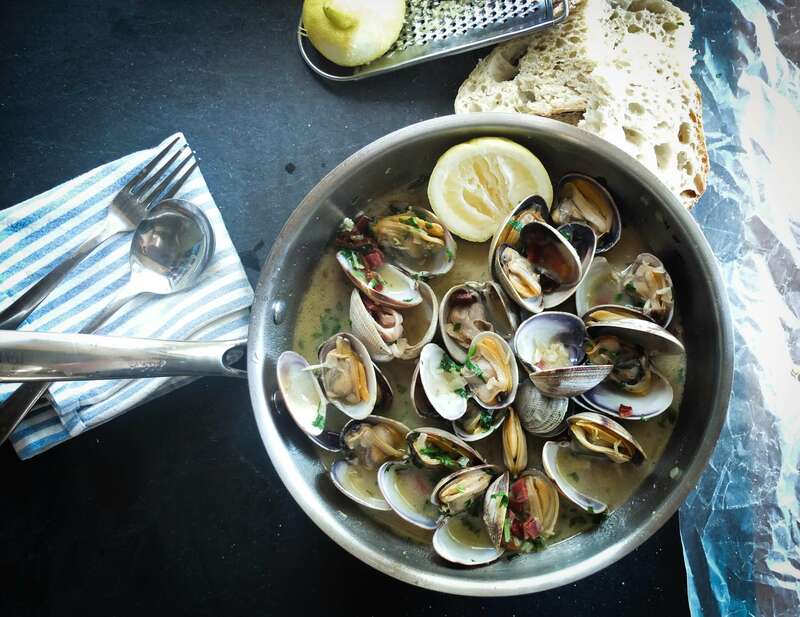 Instead of wine, you can also use salt water to steam mussels. In that case, eating the mussels without dip won’t taste that good. Use garlic mayo sauce or tomato sauces as side dishes with mussels steamed with salty water. Pan roasting mussels is pretty simple and easy to be honest. You should heat up the cast-iron skillet beforehand. Use mussels and flavoring as you please in pan roasted mussels. We usually use salt and pepper for flavoring but feel free to use other spices as well. Cook the mussels until it gets open. Understand that all the mussels won’t open at the same time. Hence, if you take out all the mussels at a time, some of them will remain undercooked and some overcooked. Therefore, the best strategy here is to take out the mussels with a tong as soon as they open. The strategy is pretty much similar as pan roasting mussels. Heat up the grill before putting the mussels on them. Put the mussels on the grill or on a cooking grate once the grill is properly heated. Use a bit of salt and pepper and cook until the mussels open. Follow the same technique here and remove the mussels once it gets opened. Grilled mussels taste really great with some garlic sauce dip or mayonnaise. You can also use mussels as ingredients to a big meal. For instance, in pasta or soup, mussels can be used. For using them in soup, you can simmer the mussels instead of steaming. 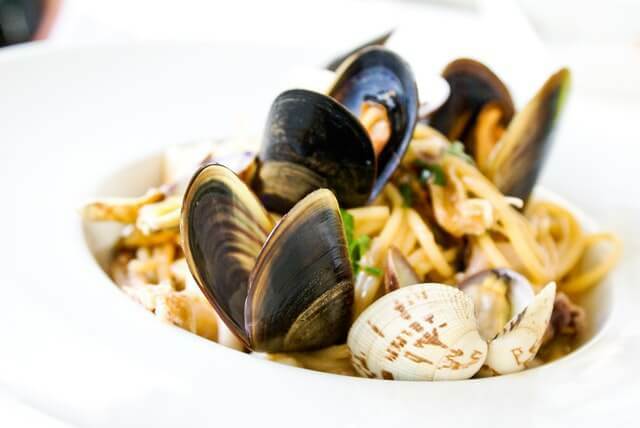 When you are using mussels in main dishes such as pasta, it’s better to use steam mussels in them instead of raw mussels. That’s because raw mussels get dried easily and the taste is not retained for long. How can we ever forget sharing some of the exclusive recipes with you? Other than eating mussels raw, steamed or cooked, mussels work as a great ingredient for myriads of seafood dishes. Be it lunch, dinner or for a quick meal, there is a mussel recipe for each one of them. If you are following the article from the top, you must have already realized that our favorite ingredient with mussels is garlic. With tomato soup and some fresh fennels, the combination of garlic and mussels become even tastier. 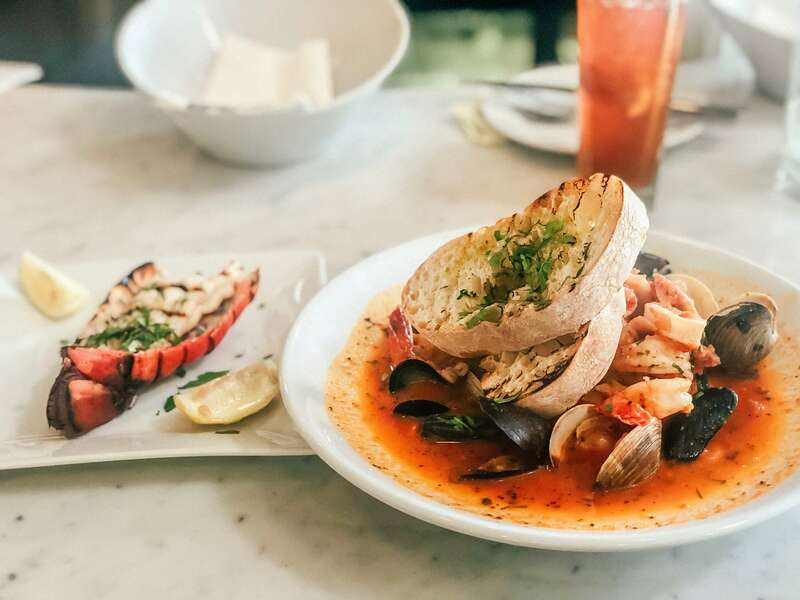 This creamy tomato broth with mussels is a fantastic sea food dish loved by all. You can use them as an appetizer or put them on the top of some good oven baked pasta. You can use this mussels with tomato and fennel recipe for reference. Yes, mussels come with a natural stuffing of their own. But the chewy and tender flesh inside tastes even better with the right mix of some great stuffing. Feel free to use any type of stuffing you want. Our favorite stuffing for mussels is aromatic rice, ham and parsley. No matter which stuffing you use, don’t forget to add some garlic clove and olive oil for flavoring. This stuffed mussels recipe is a common one and you can give it a try at home. When you are cooking a seafood special dinner, we would recommend going for an all seafood platter. Adorn the platter with some good shrimp and mussels. We would it when it’s served with some garlic bread and mashed potatoes. Use a combination of steam and grilled mussels along with some cooked shrimp. You can use this seafood platter recipe idea for the garnishing and technique. Instead of salmon and gravadlax, use steamed and grilled mussels. The bottom line is that mussels taste great. Whether you are a seafood fan or not, you would absolutely love it. The chewy taste and ocean flavor is what sets it apart from rest of the seafood items. Feel free to consume fresh mussels without any worries. You should only be careful if you are allergic to shellfish. FoodSharkmarfa is a participant in the Amazon Services LLC Associates Program, an affiliate advertising program designed to provide a means for sites to earn advertising fees by advertising and linking to Amazon.com. Amazon, the Amazon logo, AmazonSupply, and the AmazonSupply logo are trademarks of Amazon.com, Inc. or its affiliates.